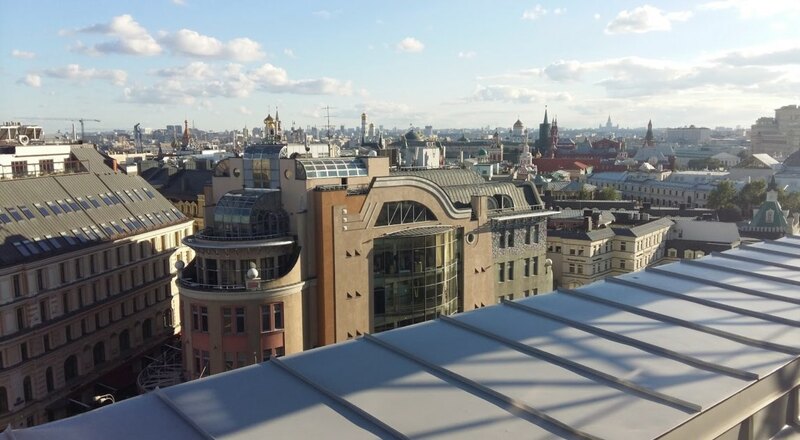 There are many places from which you can witness the best panoramic views of the city of Moscow: natural viewpoints, historical monuments, skyscrapers, a TV tower or panoramic restaurants. Natural viewpoints, such as Sparrow Hills. Historical monuments such as Ivan the Great’s Bell Tower in the Kremlin Complex or the Cathedral of Christ the Savior. Stalin’s skyscrapers, the Seven Sisters. The skyscrapers of the Financial District of Moscow. Panoramic restaurants or even shops that have their own lookout. Some of these places are free, such as Sparrows Hill, in others you have to pay an entrance fee to access the observation platform, such as the skyscrapers or the monuments, while in the panoramic restaurants you must eat in them to be able to enjoy the views. Sparrow Hills (in Russian, Vorobiovy Gory) is one of the highest natural lookout points in Moscow, located on the banks of the Moscow River. Between 1935 and 1999 it was known as Lenin Hill. It reaches a height of 70-80 meters above the level of the river. From this hill there is a spectacular panoramic view of the city (as long as there is a clear day). It is a very popular place among locals, where you will also find many tourists and couples taking pictures. From this hill you can also admire some of Stalin’s Skyscrapers, popularly known also as the Seven Sisters, among which we can highlight the impressive building of the University of Moscow, very close to this hill, or you can observe the skyscrapers of the Financial District of Moscow City. You can also buy Russian souvenirs, like the famous matrioshkas, in some of the stores that you will find there. Just below this hill, on the other side of the bank of the Moskva River, you can find the Luzhniki Olympic Stadium, which opened and closed the Summer Olympic Games of 1980 and which will also host the 2018 World Cup. In this place you will also find a ski jump platform along with a chairlift, as well as a dock from which you can navigate along the Moscow River. 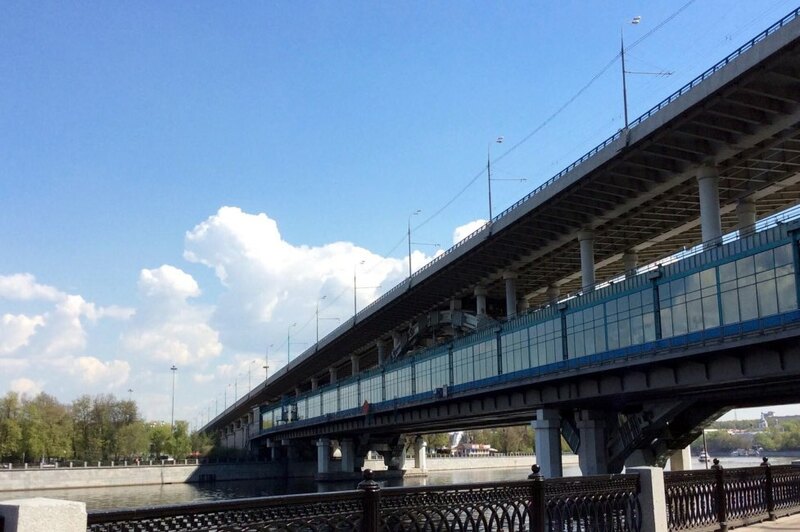 You can reach this hill on trolley bus number 7, which stops at Kosygina street, or you can also take the Metro to Vorobyovy Gory station, from which you can walk to Sparrow Hills in about 20 minutes, by crossing the glass enclosed bridge from the Metro station on the Moskva River (see photo below) and going up through a nice park, until you get to the viewing platform. 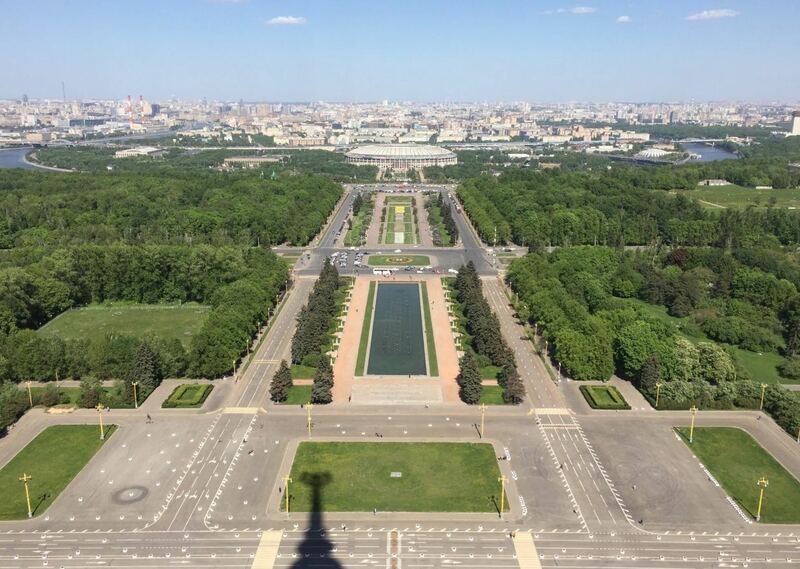 It is also possible to climb to the highest point of some historical monuments of Moscow, such as Ivan the Great Bell Tower or the Cathedral of Christ the Savior. It is the highest tower within the Kremlin Complex, with a height of 81 meters. 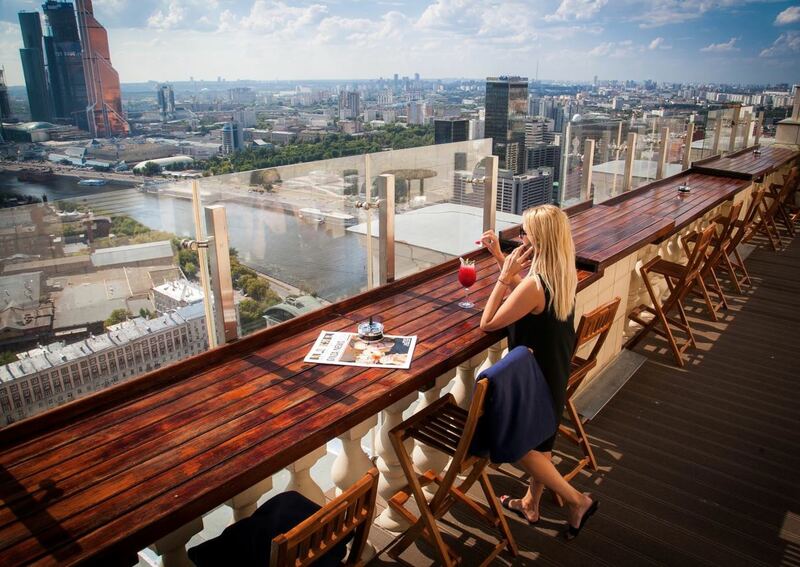 Its centric location provides fabulous views of Moscow. The interior of this cathedral houses the History Museum of the Kremlin. The entrance fee costs 250 rubles. Children under 14 years old are not allowed to go up the tower. 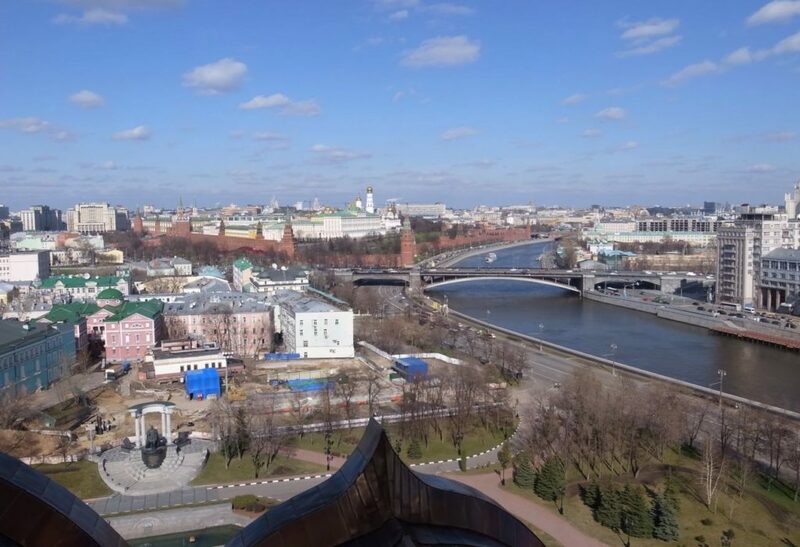 It is possible to go up to the the panoramic platforms located between the belfries of the Cathedral of Christ the Savior, located at a height of around 40 meters. 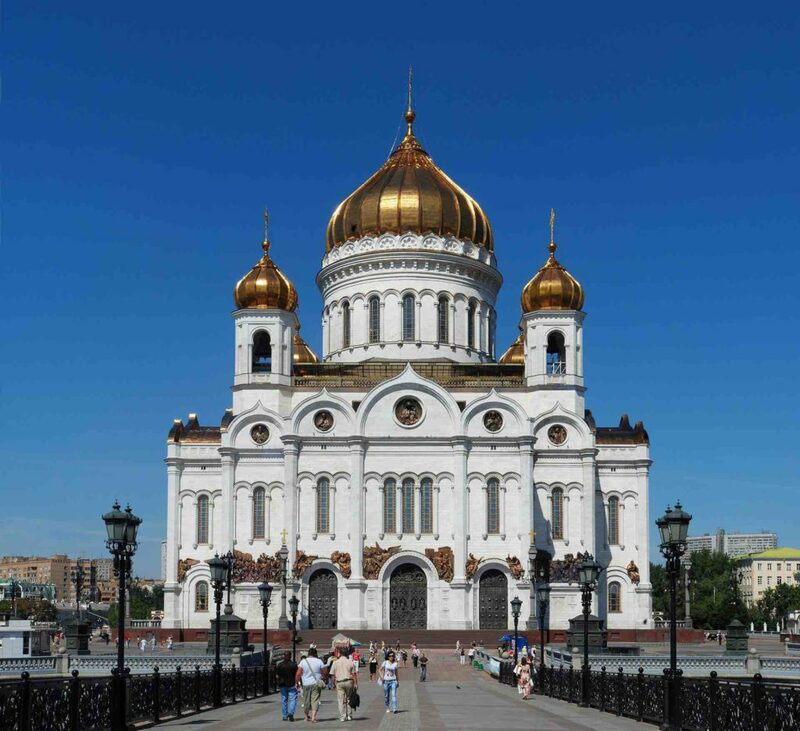 The centric location of this Cathedral allows visitors to enjoy fabulous views of the center of Moscow: the Moskva River, Gorky Park, Stalin’s skyscrapers, the Kremlin, etc. The visit to the panoramic platforms is only available for groups of tourists with prior reservation (through numbers +7 (495) 637-29-67 and +7 (495) 637-28-47). 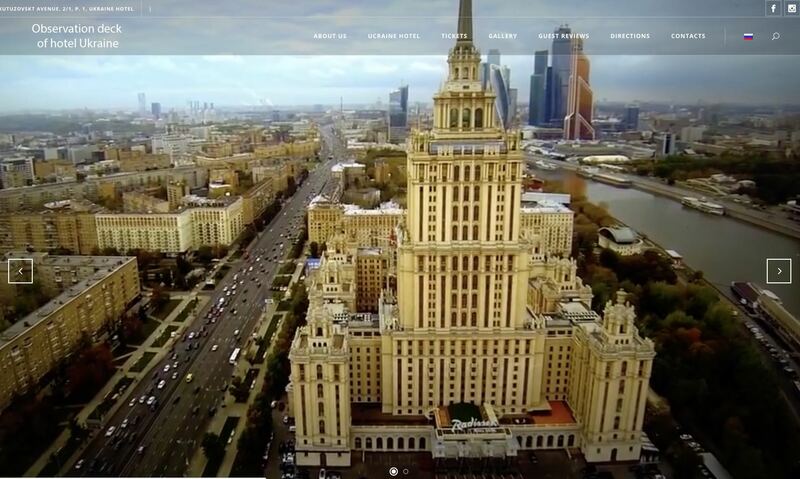 Stalin’s skyscrapers, more popularly known as the Seven Sisters, are a set of seven skyscrapers built in the 40s and 50s in Russian and Gothic baroque style, to commemorate the city’s eighth centenary (in 1947). The skyscrapers are located in the western district of Moscow. It is possible to climb some of them, such as Hotel Ukraine or Moscow State University. One of the Seven Sisters to which we can go up to is the Hotel Ukraine, known today as the Radisson-Royal Hotel. The observation platform is located on the 33rd floor of the building where there is a cafeteria. The general entrance costs 1,000 rubles and gives right to consumption (coffee, tea, juice or mineral water). There are also guided tours in English, Spanish, Portuguese and Japanese, explaining the history of the 7 Sisters of Stalin and where you can visit the Moscow in Miniature Diorama (it is necessary to book in advance; you can find more information at: http://moscowpanorama.ru/en/2016/10/25/a-tour-guide-on-observation-deck/). The skyscraper measures 198 meters in height. Its construction started in 1953 and finished in 1957. It was also restructured between 2007 and 2010 with the name Radisson Royal Hotel. It has 505 rooms, 38 apartments, restaurants, a conference room and spa. Several bus lines stop at the hotel: 91, 116, m2, n2, etc. 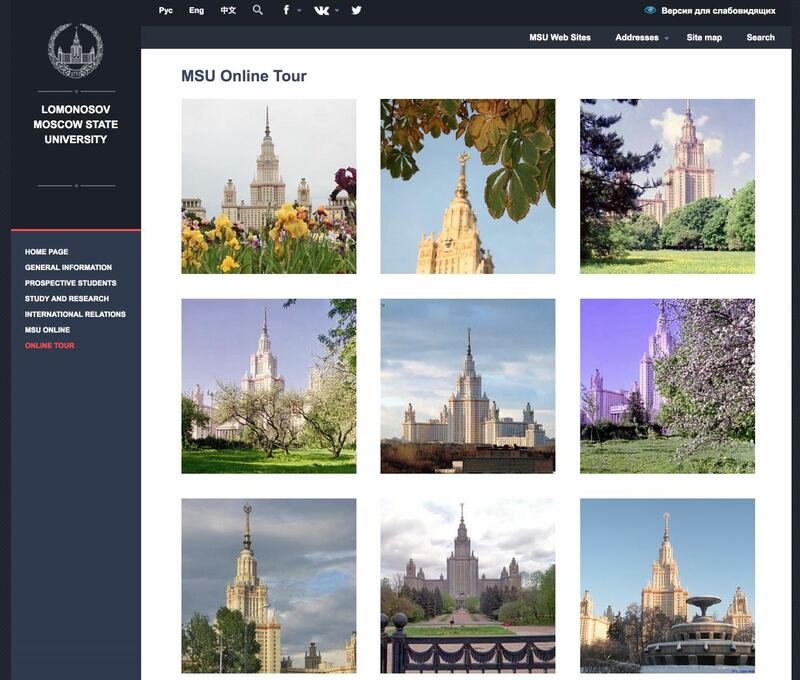 Next to Sparrow Hill you can find one of the Seven Sisters: the imposing building of the Moscow State University. You can climb this building to visit the Earth Science Museum, located in floors 24 to 32, and from which you can peer out to its terrace for a fantastic view of Moscow. In this museum you will also find an exhibition on the history of this skyscraper. The building is 240 meters high. Its construction started in 1949 and ended in 1953. Next to the University you will find the Universitet Metro Station. 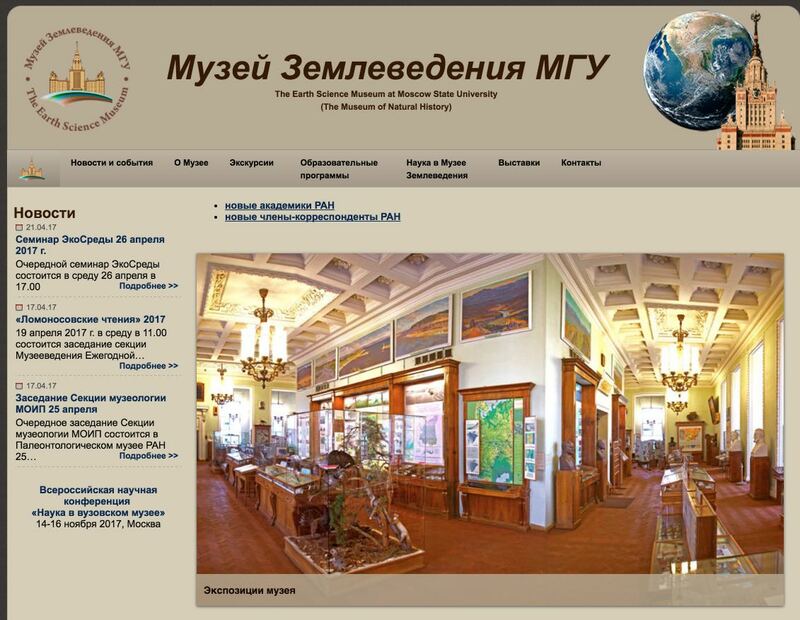 Museum of Earth Sciences website (Russian): http://www.mes.msu.ru/. The museum is open from Monday to Friday from 9:00 a.m. to 5:00 p.m. It is closed on holidays and the last Friday of each month. 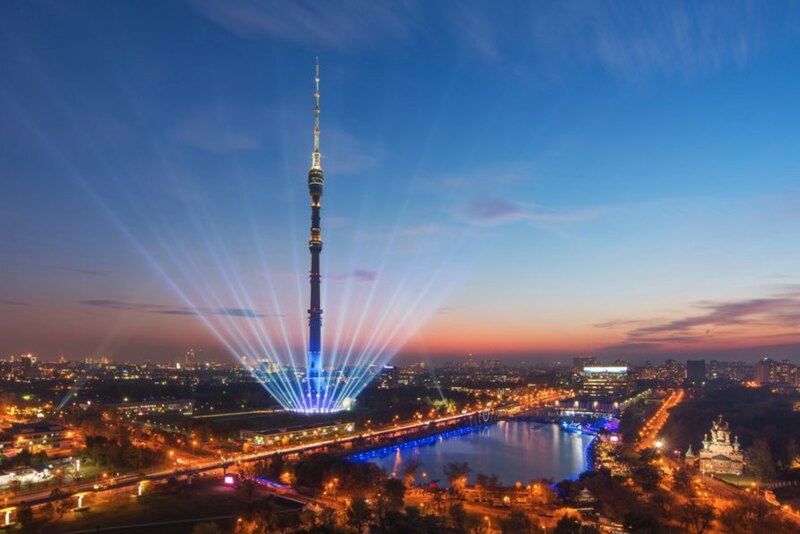 The Ostankino Tower is a telecommunications tower, which is 540 meters high, being the highest telecommunication tower in Europe and the fourth highest in the world. It is the eighth tallest building in the world (the tallest building in the world is the Burj Khalifa, located in Dubai and is 828 meters high). The Ostankino tower was the tallest building in the world between 1967 and 1976, and the first in the world to exceed 500 meters in height. It was inaugurated in November 1967, on the eve of the 50th Anniversary of the October Revolution. The project was carried out by the Soviet engineer Nikolai Nikitin. It owes its name to the Ostankino neighborhood in Moscow, located to the north of the city and in which the tower is located. The tower offers radio, television and telephone services to more than 15 million people, but it also has a tourist service, consisting on visits to the observation platform of the tower, located at around 340 meters high. The visit costs 1,000 rubles (600 rubles if you visit between 10 and 11 in the morning). Children pay half. The tower’s construction began in 1960 and finished in 1967. In August of 2000 there was a fire at the height of 460 meters, in which the tower resisted, but 3 people died. After reconstruction work, the tower was reopened in February 2008. 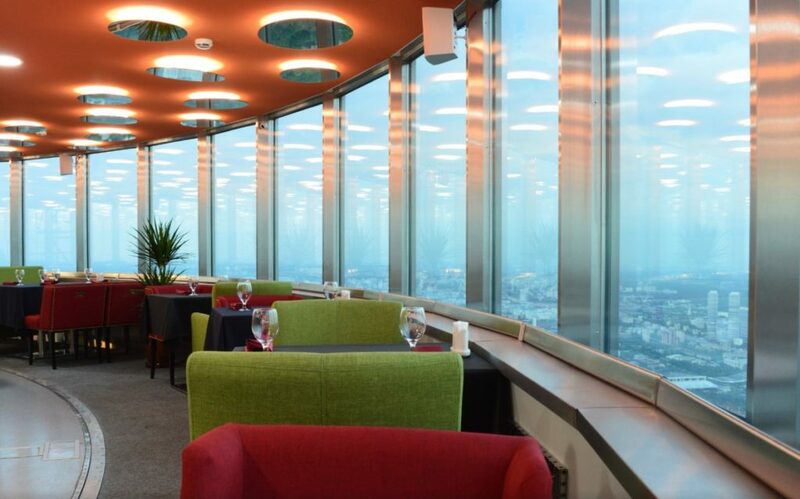 Just below the viewing platform, you can find the Seventh Heaven restaurant, circular rotating restaurant. You can reach this tower in Metro (VDNH station) or by trolleybus (numbers 13, 69, 73 and 36). Moscow City is the International Business Center of Moscow. It is located in the Presnensky District, in the west of Moscow, in the Third Ring. It is a city within the city that combines business centers, residential spaces and shopping and entertainment areas. It is possible to visit the observation platform, located in the Imperia Tower building, and located at 242 meters high on the 58th floor. The construction of this tower began in 2006 and ended in 2011. The visit costs 700 rubles for adults and 400 rubles for children. It can be reached by Metro (Vystavochnaya stations and Business center). Another option is to go up to the observation platform of the Central Children’s Store at Lubyanka. It is located on the top floor of the store (the seventh floor). And despite not being of a very high altitude, it does provide a good overview of the center of Moscow. Admission is free. In any case, if you go with children or you are looking for a gift for children, it is well worth visiting this store. 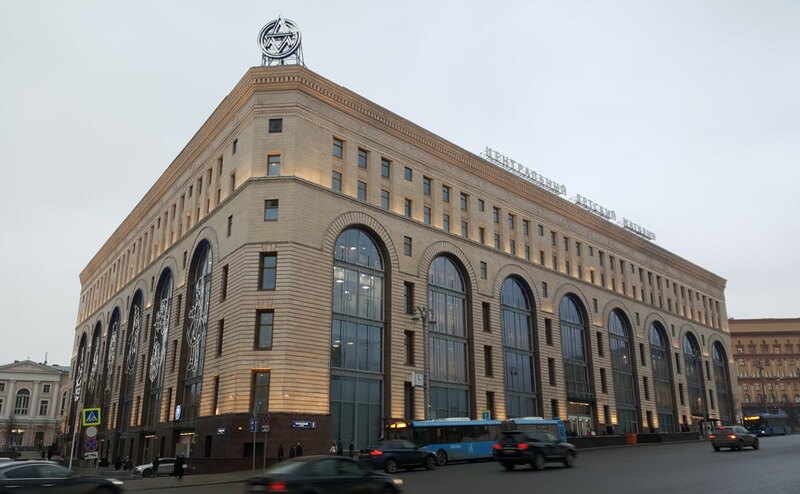 The shop is located in the center of Moscow (Lubyanka Metro station). 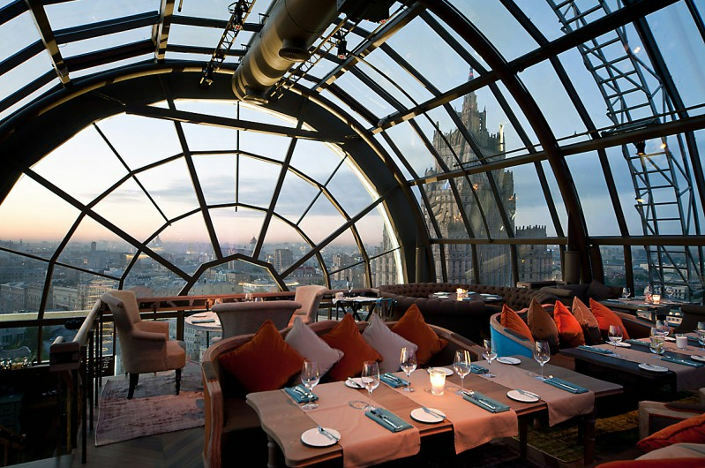 Have you seen panoramic views of Moscow from any of these places? What has been your experience?